Queensland’s total average rainfall varies quite significantly from year to year and region to region and it’s not unusual to see vastly different weather patterns between decades and areas. These variances are largely owing to the fact that Queensland’s total rainfall is affected by the El Niño and La Niña weather patterns, tropical cyclones and coastal winds, all of which are dependant on a number of factors which are highly variable. 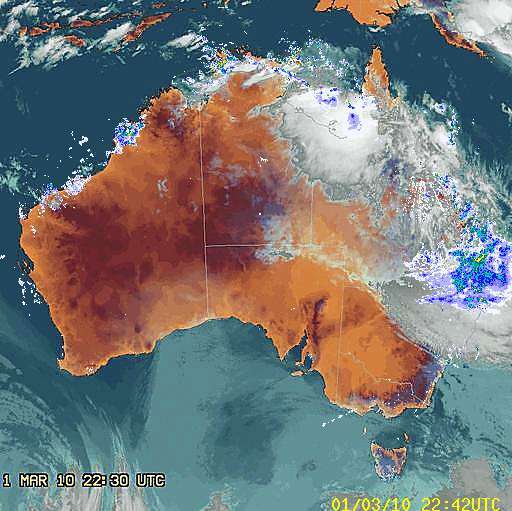 The far northern region of Queensland experiences the most rainfall in Queensland, and indeed Australia. It’s not unusual for this area to receive more rain in 24 hours than other Queensland areas receive in a year. Most of this rain falls in the Summer and is a result of the monsoon winds . This area is also prone to extreme heat and areas in the region have recorded temperatures as high as 51 degrees. As this region experiences such a lot of rainfall in a relatively short period of time it’s important to have a tank that’s large enough to collect and store sufficient water to sustain you through the drier periods. Depending on the roof area (larger surface areas collect more water) and your water use requirements a tank size of 22,500 to 46,400 litres would be ideal as it allows you to take advantage of the heavy summer rains and drier winters. Gutters should be cleaned once every three to four months, and regularly during the wet season to ensure that the flow of water into the tank is not obstructed. All tanks will need to be properly installed – always make sure that you consult someone so as to ensure the tank is properly supported and connected. The central areas of Queensland generally experience little rainfall as one moves inland and far western areas are prone to periods of extreme heat and severe drought. In the central areas tank size recommendations depend on the roof area, but generally a larger tank is propitious to ensure there is sufficient water available to carry you through the dry season. The most popular sizes in this region are the 20,000 litre to 46,400 litre sizes. Use your collected tank water in your toilet and to supplement activities such as washing dishes, showering/bathing Ensure that your gutters are clean and in good condition prior to the rainy season (we recommend that you clean them every 3 – 6 months) to avoid contamination of your water supply, particularly if you are using it to supplement your household water. Consider installing water tanks on carports or connecting gutters on patio roofs to increase the surface area and your water collection potential. Keep your tank clean and consider installing a first flush device to avoid debris accumulating and water stagnating during the dry period. The central and southern coastal areas of Queensland experience a fair amount of rain in the summer, with the average annual rainfall being approx. 1585 mm. Most of this rain falls from December to March and the driest months are August and September. Over the last few years temperatures have been high and heat waves in the summer months are not uncommon. To ensure you are able to make the most of the rainfall in the summer months we recommend a tank size of between 15,000 and 46,400 litres depending on roof area and water use. Using your rainwater tank to supplement your daily activities, such as watering your garden, in your toilet and for showering or bathing can save you a significant amount of money and water. If you’d like to know just how much, find out using this water usage calculator. The areas in the South west of Queensland experience an exceptionally high number of days with no cloud cover and rainfall levels are generally below the Queensland average. The South Western areas of Queensland have a history of drought and water restrictions and non coastal regions typically only experience between 400 and 600 mm of rain per year. In winter this area can experience freezing temperatures despite being in the northern part of Australia. Freezing temperatures will not have an affect on a polyethylene tank, however the fittings used need to be protected from the cold where there is a risk of pipes freezing. Use your rainwater tank to supplement your daily household activities such as washing the dishes or bathing. In addition, doing seemingly small things such as only running the dishwasher when it’s full or installing a water-efficient showerhead can save you a significant amount of water in the long run. For more water saving tips, click here. If using your tank to water your garden, ensure that you do so in the evening during summer. Planting indigenous plants will also reduce the amount of water needed to keep your garden looking good.